There is major news tonight on the economic front. Government issued a release late this evening to announce the sale of the exclusive island of Caye Chapel. The high end destination had been on the market for some time and there were many interested parties, but the sale had now taken place. The facilities include eight beachfront villas, eleven marina view casitas and an eighteen-hole championship golf course. 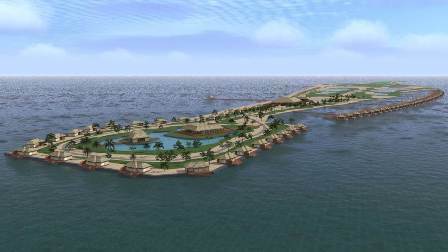 According to a release from BELTRAIDE, the two hundred and sixty-five acre island has been bought by a Mexican luxury hotel development group. The group is owners and operators of luxury tourism developments in prime locations in Mexico City, Cancun and Acapulco. 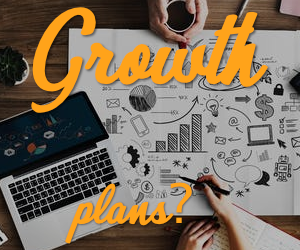 A detailed development plan is being worked out which is expected to include a partnership with a global luxury hotel brand. 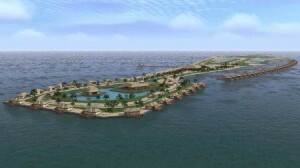 According to government, the development of the island will commence early in 2015. The price tag is not known. Wow, selling off the country one piece at a time. The Mexican company will bring in their own Mexico natives to work the resort while the people of Belize go without jobs. You people have choices but you sit back and let this government crap all over you and you don’t even lift a finger to save the future of your children. The people in this administration are straight @$$3s !!! No other country in the world “SELLS” their land to a company. It’s called “LEASING” your land for the benefit of your country, not for the benefit of a company from another country. I am surprised I don’t see protests across the country to dethrone Barrow especially since B@ttym@L@ wished they could buy up Belize nuh. Cho !!! Why do you even bother complain about the people… 90% of the people you are complaining about do not have internet. So who are you complaining to. The people who are benefiting from it? Silly people…. if you want to make a difference, go out and speak about it! What does GOB has to do with this after it was a comercial bank that sold it. 100% of the people in this administration have internet access. 90% of the population more than likely have a television in their place of residency. Since you calling me silly, why did you include me in my response then? Besides, I reside deh inna farrin and I speak out erreday yaso wen mi par wid sum odda Belizean brethens dem cah seh mi kno wah gwan inna Belize wid di bagga politricks f^ck3ry. Any time a company buys up another company (competition) or a patent (idea) or land (advertisement) is because of economic interests. That would boost the economics of the company and that money would circulate back into the country after taxes. Basic microeconomics. If I was a citizen in Belize, instead of relying on internet access I would of got on the news and challenged Barrow. All you been doing is waiting on the next person to speak on your behalf because you too to lazy fi dweet unuself. Did they teach you anything in school in “Lee Belize” besides “Kriol”??? Land by law is protected by the governing laws of the country which constitutes it being federal and not private hence Belize belongs to Belize not to B@ttym@l@ nor Nex-A-h03. A private company is not the government, piece of land nor a country in itself. Private companies can own property (commerical buildings, residential homes, distribution of their products, services and etc.) on land that is leased to them. What happens if the company goes bankrupt? Are you telling me the home country in which the company had established its business from the beginning now has the legal right to annex the land that the company had purchase in a foreign country? Last time I checked, a commerical bank is not an embassy of Nex-A-h03.